Someone who works as a courier got in touch recently to let us know his thoughts about NZTA’s proposed Basin Reserve flyover. We think these thoughts are worth sharing with you. NZTA, are you paying attention? “Driving around Wellington and using the Basin reserve roundabout is a regular feature of my day. I have a car that ‘knows its own way to the airport’ as my wife works/flies out of Wellington airport with her employment (Air NZ) whilst my son instructs flying at the Wellington Aero club. Added to the frequency of driving to/from these two locations from Central Wellington is my courier work in and around the town. Yes, it is a town and sorry for those whose city status beliefs I may have offended. My driving whilst on duty requires me to negotiate the Mt Victoria Tunnel to access Miramar/Hataitai/Airport and also to access Adelaide Street/Newtown and the delights of Island Bay. I do this at all hours of the day and evening in addition to my husbandly duties in taking said spouse and/or son to their work destinations, Pac n’ Save in Kilburnie is also patronised by me/us in a private capacity which involves the Basin and tunnel. The main point here is that the traffic flow around the Basin is easy and ‘businesslike’ with a sensible phasing of traffic lights. Very rarely indeed does traffic back up into the tunnel as you exit en route to the Basin. Proceeding in any combination of approaches/exits does not cause any issue, motorists use the two/three lanes affording approaches to each roundabout intersection with a high level of responsibility. Red light infractions are rare in my observation. Simply put there is no need to do this [build a flyover] as the light phasing is reasonable. The recent re-routing of the approach to the Taranaki Street intersection via top of Tory Street has not impacted the flow despite the new traffic lights. Wellington Scoop suggests that the reason for the delay may be a long list of requirements that such a concrete monstrosity could not possible meet. Lindsay Shelton, Editor of Wellington Scoop, is one of the speakers at our public meeting, and I’ll be keen to hear more about his thinking on this. We don’t know how long this delay may continue: NZTA may lodge its application tomorrow, or they may take months. But let’s make one thing very clear: the Save the Basin Campaign is very much in favour of these delays. Long may they continue! In fact, if NZTA delays long enough, maybe they will eventually come to the realisation that the entire misguided, unnecessary and just plain ugly Basin flyover project should be consigned to the dustbin of history. How do we plan to save the Basin Reserve from the Government and the NZTA’s flyover plans? And what can our supporters do to help? 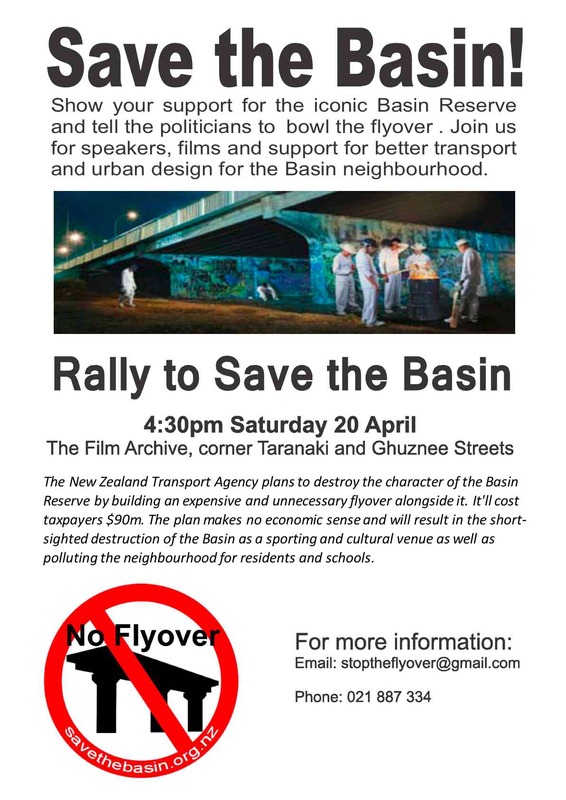 That’s the focus of our “Rally to Save the Basin”, which is being held at The Film Archive, cnr Taranaki and Ghuznee Streets, from 4.30-6.30pm on Saturday 20 April – that’s this coming Saturday, folks! Lindsay Shelton, editor of Wellington.Scoop and co-founder of Waterfront Watch. Mary Varnham, publisher at Awa Press and founder of the “Chaffers Park Make it Happen” campaign. Joanna Newman, Save the Basin Campaign spokesperson and Mt Victoria Historical Society Chair, with the wider historical perspective. Tim Jones, co-Convenor of the Save the Basin Campaign, on the current state of play on the flyover campaign. Who stands where? What happens next? What are the key things the campaign needs to achieve? Murray Parker, active Save the Basin Campaign member, on how supporters can get actively involved in the campaign and what help we need. So if you want to know where the campaign stands, what happens next, and how you can help, this is the place to be. Please invite your friends, join the event and invite your friends if you’re on Facebook, and come along!